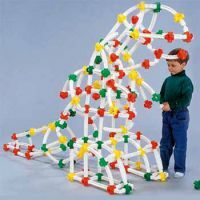 No Ends Construction Sets let you build anything you can think of with the straight struts, curved beams, and connector cubes. Choose from three sets: Helicopter Set, with 150 pieces, lets you make a helicopter you can really sit in! Spaceship set, with 250 pieces, has everything you need for a kid-sized star-crossing shuttle, even wing plates. And the Dinosaur Set, our biggest set at 350 pieces, lets you build a fierce T-Rex, and also comes with the spaceship panels.